There are posts on the working of relays, types of relays and so on. To know about them click on the links below. 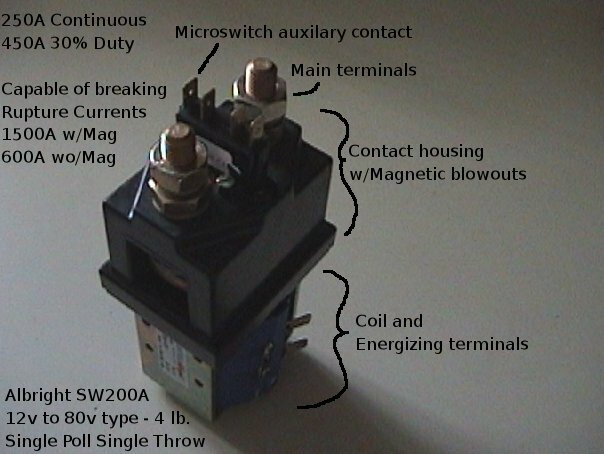 A contactor is also a type of relay. Although they have been explained in earlier posts, their wide use and significance needs to be explained in detail. A contactor is a relay that is used for switching power. They usually handle very heavy loads like an electric motor, lighting and heating equipments and so on. Though their output is used for switching very high loads, they are controlled by a circuit with very less power. Though they are used for switching purposes, they do not interrupt a short-circuit current like a circuit breaker. The contact part of the contactor includes the power contacts as well as the auxiliary contacts. The power contacts gains the power for the contactor and the auxiliary contacts is used to bring a loop with the rest of the rest of the devices it is attached to. These contacts are connected to the contact springs. The contacts are controlled by the electromagnet. These electromagnets give the initial force to the contacts and make them closed. Both these contacts and electromagnet are enclosed in a frame which is usually made of insulating materials. The usually used insulating materials are Nylon 6, thermosetting plastics and so on. They are useful, as they completely insulate the contacts and help in preventing the touch of contacts. For high-end contactors, an open-frame contactor is commonly used. This will provide a greater protection from oil, dust, weather and also from explosion. Â The type of frame housing used may also differ according to the voltage rating used. The ones given above are restricted up to a certain voltage. If the contactors are used to manage volts higher than 1000 volts, inert gases and also vacuum is used as frame housing. Contactors are also used in DC circuits. For their use in DC circuits, magnetic blowouts are also used. The use of blowout coils help in stretching and moving the electric arc. The electric arcs can be AC or DC. An AC arc will have can be easily extinguished as they have low current characteristics. DC arcs of the same current characteristics need more stretching need more current to be blown out. They ratings differ from about 500 Amperes to about 1500 Amperes. In order to save power in a contactor when it is closed, an economizer circuit is also introduced. This circuit helps in reducing the coil current. There is difference in the amount of power that is required to close the contactor and that from keeping it closed. Greater power is required to close it. This circuit will also help it to stay cooler. Take a look at the diagram given below. As contactors are used for high-current load applications they are designed to control and reduce the arc produced when the heavy motor currents are interrupted. Â Other than the low current contacts, they are also setup with Normally Open contacts. Â These are devices which handle more than 20 Amperes current and over 100 Kilo Watts power. The contactor has an AC/DC supply driven coil input. This will depend on the requirement. Â This coil will mostly be controlled by a lower voltage PLC. They can also be controlled by the motor voltage. The motor may have series of coils connected to either control the acceleration or even the resistance. When current is passed through the contactor, the electromagnet starts to build up, producing a magnetic field. Thus the core of the contactor starts to wind up. This process helps in energizing the moving contact. Thus the moving and fixed contacts make a short circuit. Thus the current is passed through them to the next circuit. The armature coil brings in high current in the initial position. This reduces as soon as the metal core enters the coil. When the current is stopped, the coil gets de-energized and thus the contacts get open circuited. Ratings of a contactor are given according to the pole of the contactor. It also depends on factors like fault withstand current, coil voltage and so on. According to their rating, contactors are classified into the following. AC3 – Starting of squirrel-cage motors and switching off only after the motor is up to speed. AC4 – Starting of squirrel-cage motors with inching and plugging duty. Hello Hi, Thanks for the information provided to me , I have understood what a contactor is . But I’m looking or searching for a masters project to do with contactors. Please help me. verry good descriptions i prowed of you.